We were up at a reasonable hour as today we were heading for Cordoba. I think the crane driver must have the weekend off as we were blessed with another peaceful night. Once scrubbed and fed, with the vehicle checked throughout for the journey we made our way to the dumping point. I had already emptied the loo by simply walking up to the discharge point and using it. Another queue but thankfully a short one. Our main hold up was a Frenchman who, like others was fascinated by the sight of his dirty water being discharged in to the drain, he was bent down studying it rather than leaving it to drain whilst he filled his freshwater tank. I tell you, these peoples are going to miss us when they have to fend for themselves after we leave the EU. We had considered pulling over and parking along the very minor, quiet road from the parking area and Aldi supermarket in order for The Chef to cross the road and make a purchase of just one fresh crusty baguette. Instead we decided to skip it as even The Chef conceded that by the time she had managed to get across the road, buy the bread, and return, it would have had time to go stale. So no fresh bread. The journey to Cordoba was very pleasant, it was very rural. There were lots of large rolling hills growing olives and wheat. There were also plenty of solar panels. 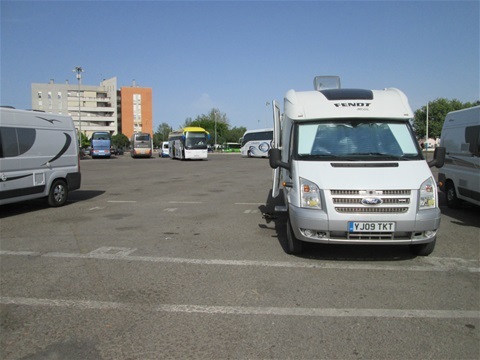 Eventually we found our free car park here on the edge of Cordoba city centre. The city lies upstream from Seville beside a loop in the River Guadalquivir, which was once navigable as far as this point. Today it is a minor provincial capital, prosperous in a modern sort of way. Once however, it was the largest city of Roman Spain, and for three centuries, it formed the heart of the Western Islamic Empire, the great medieval caliphate of the Moors. It is from this era that the city's major monument dates: the Mezquita, the greatest and most beautiful mosque ever constructed by the Moors in Spain. We popped across the road to the shopping mall in the hope of finding somewhere to buy a plain crusty baguette, but it was not to be. In the end we bought one large ham & cheese baguette and took it back to the vehicle, cutting it in half for lunch. After a rest we went for a walk to get the measure of the place. After paying lots and lots of attention to our tourist map, which I had lifted from the Tourist Office in Guadix, we came across the Roman Bridge. Over we went, and on the way over I spotted the Arab waterwheels to our left. No longer in the water unfortunately, still that's Global Warming, silt, or something else to blame. The town was crowded, absolutely stuffed with locals and Yanks. We made our way to the ticket office at the Mezquita to ask if we could buy a ticket today for entry tomorrow. No, basically, was the answer. From there we made our way towards the Christian Castle for a few photographs of the exterior as it would have cost us €4.50 each to look around inside. From there we had a pleasant walk in the shade along the side of the Arabic Walls. So much of it was covered in graffiti but I managed to take a few pictures without having them in the shot. The graffiti was a more modern addition, probably around the 'Espana Knuckleusdraggus' period. After a long hike around the outside boundary of the city we came to the Jewish Quarter. Yet another Jewish Quarter I hear you say. I know, I know, but what can I do? These quarters are everywhere. Having wandered through many, many narrow back streets, we ended up around the exterior walls of the Mezquita. All very nice. But it was so hot, and crowded. Enough was enough. We made our way back to our motorhome for a nice cold beer, straight out of the fridge. 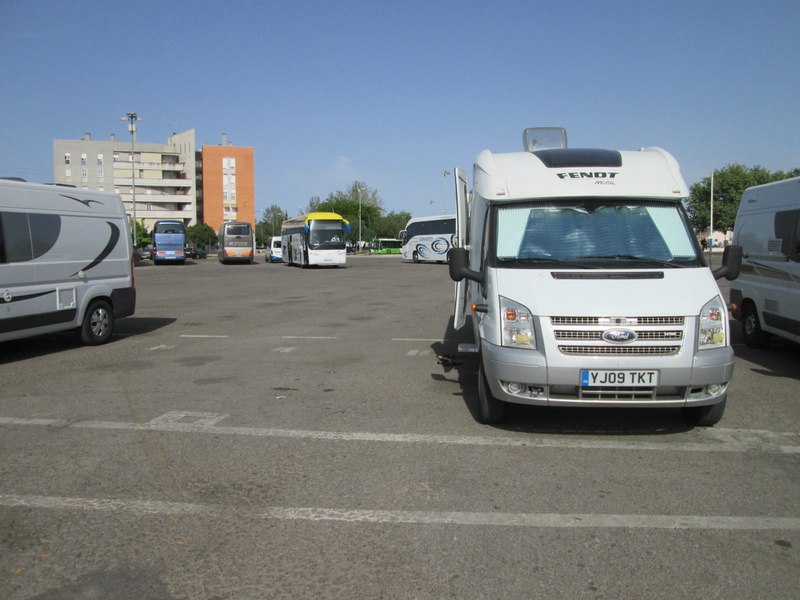 I re-parked the vehicle further up the car park between two French hire motorhomes, leaving a generous amount of space between us all. Eventually Frog number one arrives back and moves his vehicle between us and Frog number two. Honestly why didn't they just park next to them in the first place? I tell you, they're gonna miss us.